Treats you like a guy that still wants to build a great physique. Focuses on every element of physique development, from strength and muscle mass, to fat loss and fitness. The host is a solid, muscular and inspiring guy, that obviously walks the walk. Contains a comprehensive range of additional education resources. It's not the cheapest on the market... but you're most definitely getting what you're paying for. Doesn't suit guys that don't want to work hard and really commit to building a great physique. This is the most comprehensive over 40s program we've ever used. Boss Prime will change the game for men wanting to build muscle and slice down to single-digit body fat. If you’re a man over 40 that likes to go in hard with his workouts, build muscle and craft a physique like a man in his 20s, you’ll love what Boss have done with Prime. The unfortunate reality that once you hit the age of 40 you begin to lose strength, muscle mass, stamina and energy. You gain stubborn fat much easier, particularly around your belly and chest. But with the right training program and the correct diet you can reclaim the physique of your youth and not only turn back the clock, but smash it in half. Created by the ‘premium’ Boss workouts brand is Prime – a workout program designed to build muscle mass, fitness, endurance and obliterate fat to show your chiseled abs. It’s not a program for guys that have given up on their dreams of a leaner, stronger and downright . You’ll need to be strong just to fight off the women that’ll be flocking your way. In this strength-based 12-week workout program, Boss pull no punches with their hottest product, Prime. And this is the basis of their whole program. It’s a mean, lean program that breaks the boundaries of the ‘older guy’ mentality to exercise. There’s no wrapping yourself up in cotton wool here – it’s all about working hard and gritting your teeth to etch out a body that you can be proud of. Designed to help guys over 40 turn back time and craft a physique worthy of the men’s magazine or stage, Boss Prime isn’t an easy ride. But let’s be honest; how many programs made for older guys are even remotely challenging. Boss smash the mold in half with prime, respecting the fact that guys over 40 aren’t over the hill and are made than willing to use their knowledge ,wisdom and motivation to achieve the physiques of their lives. If you’re a guy that’s in the prime of his life and wants to make real changes, this is the program you need. Boss is very quickly establishing itself as the leaders in the digital fitness program arena. They’ve gone all-out to bring you the hottest coaches out there and the brightest science minds to develop body transformation programs that blow everything else out of the weights room. As an older guy, Darrin Robinson knows exactly how to build an impressive physique after 40. He’s got over 20 years experience in the fitness industry – both as a coach and athlete. He’s your host in Boss Prime and mixes maturity with energy as he takes you through everything you need to know about Boss Prime – from the training methods used in the program to every individual exercise. His videos are great to watch. he’s a lean guy with some great muscle detail. A qualified personal trainer and successful coach and bodybuilder, Darrin brings an authority and a kind of ‘don’t mess with me dude’ attitude to Boss prime. But he balances this assertive, almost military approach to training with genuine care for you progress – it’s a great mix and everything you want from your host. Lee is a UK-based sport scientists with an eye for great fitness programming. He’s a top-of-his-game educator, having spoken at fitness and medical convention, and running his own successful consultancy for athletes and coaches. 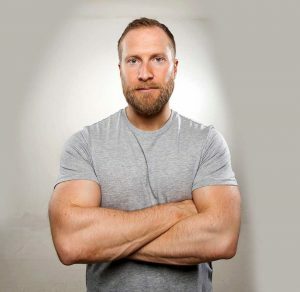 As a personal trainer, speaker and researcher with an MSc, Lee brings an educational angle to Boss Prime. He’s responsible for creating the training guides that come with the course. Lee knows exactly which training methods to use, and how to select the best exercises to improve your fitness, muscle building science and fat loss knowledge. He’s also currently completing a PhD in strength and conditioning so you know this guy is the real deal. What Do You Get With Boss Prime? Extensive training guide – This brilliant guide covers everything you need to know about getting the best from your Prime workouts. From how to structure reps, sets and volume for strength and muscle mass, to optimizing testosterone levels. 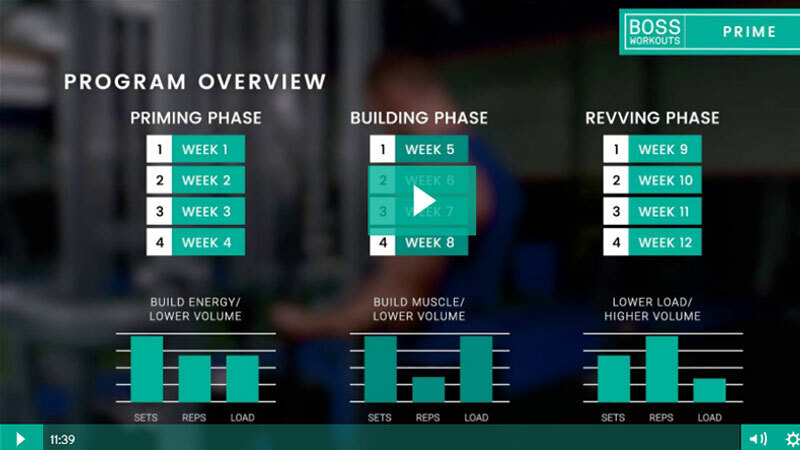 Video series guide – Darrin uses his assertive personality and motivating coaching style to teach you everything you need to know about the program, the workouts and technique for every single exercise. Nutrition guide – Working alongside your training guide, this journey into nutrition covers all of the key areas of fat loss, fitness and muscle building. From calories and macros to foods that boost testosterone levels. What Will You Achieve With Boss Prime? This is your best opportunity yet to carve out a physique worthy of a guy half your age. Boss Prime isn’t a walk in the park. But if you’re a guy that wants to make some huge changes to his body, mind and lifestyle, you don’t want it to be. This 12 week body transformation program avoids the monotony of basic training and instead goes for a phase approach. In Boss Prime you’ll find 3 distinct phases, each with their own individual targets that push you towards your end goal of a leaner, more muscular physique. This is explained in lots more detail in the training guide that comes with the program. In this first block of training you’ll be tackling the gym with 3 workouts each week. Using a balanced program with large muscle, compound exercises, the aim is to dust off the cobwebs and build serious foundations of fitness. You’re priming your nervous system, muscles and metabolic response with fast-paced strength training that’ll start to harden up those muscles that’ve started to get weak and flabby. In the building phase there’s only one goal… to boost muscle mass and strength as much as possible. Following a full body approach once more, Darrin tells you to grit your teeth, get comfortable with heavy weights and start to hit your workouts with full force and effort. This is a more challenging phase but still allows you to go at your own pace if needed. Why do Boss call this the revving phase? Well, it’s time to accelerate your metabolism to full throttle as you switch your training up to maximize fat burning. This final block of workouts sees the biggest shift in pace as you take the rep range up and throw in some brutally high volume workouts. It’s all about stripping back the fat, optimizing conditioning and peaking your fitness. It’s all about uncovering the work you’ve been putting in for the last 12 weeks. It’s time to see what you’ve created. After completing this program we saw some great results. Our chest, shoulders, arms and legs were showing significant improvements in muscle mass. Our abs were tighter and leaner and energy levels were off the chart. Endurance was good and general cardio felt easier too. Even stamina away from the gym (let’s just say ‘bedroom time’) was better too – not only a boost in libido, but performance as well. We we’re commited throguhotu and that’s why we got results. We’re not sure how well you’d do if you cam at this half-hearted. Who Is Boss Prime For? Prime is designed for any man over 40 that wants to reclaim the muscle, strength, athleticism and energy of his youth. The kind of guy that refuses to let their age define them and won’t be defeated. You might have some experience of strength training but have had time off. Or you might be completely new to weight lifting but are willing to give it your all. Even if you regularly hit the gym, already have decent muscle mass and just want some new ideas on training from one of the best trainers in the US, Boss Prime is your number one choice. The best thing about Boss Prime is that it’s versatile. It allows you to choose your starting point and work around a program that suits your own fitness levels. This means you can make it as easy or as hard as you want to. And because each phase progresses in intensity and volume, you’re always going to get stronger, fitter and leaner. Most guys in their forties and fifties will have grown up on split training. Those workouts where you train one muscle per workout in a ‘chest day’ and ‘leg day’ style approach. For that reason you might be disappointed at first to learn that you’ll not be using that program in Boss Prime. But science has moved on… for the better. But let us tell you this – full body workouts are far superior for fat loss and muscle building. Not only is the research pretty clear on the benefits of total body workouts over splits, the best coaches know this. The older guy market is pretty buys. There’s plenty to choose from and to an extent, many of these programs work. But Boss Prime is the most comprehensive, detailed and effective program you’ll find. It slams the competition to the floor purely based on the program itself, let alone with the training and nutrition guides and meal plan. How Much Does Boss Prime Cost? If you were to hire a trainer like Darrin you’d be looking at thousands of dollars for a 12-week block. Boss Prime brings you the best coaching, resources and body transformation tools for just $90 (£65 if you’re in the UK). That might sound like a lot. But look at it like this. Firstly, you most definitely get what you pay for. It’s not just the program itself but the tons of resources you’re getting with it. Secondly, $90 wouldn’t even buy you a week’s training with a run-of-the-mill trainer at your local gym. Let alone one of the best in the US. factor that in and it’s an unbelievable price for 3 full months of training. And whats more – once you’ve bought it, it’s yours for life. You can return to the program over and over if you like – or come back to it if you have to take a break.